Thursday through Monday by prior reservation. Guided by a team that includes acclaimed Winemaker Henrik Poulsen and renowned Viticulturist Garrett Buckland, Acumen is dedicated to creating the next great Napa Valley wine estate. To achieve this goal, Acumen has established an estate program that features 116 organically certified acres of vines, spread across two remarkable vineyards on Napa Valley’s Atlas Peak. From these coveted grapes, the Acumen team crafts estate-grown wines, with a focus on mountain-grown Cabernet Sauvignon and Sauvignon Blanc. Taking their inspiration from the legendary Napa Valley Cabernets of the 1960s and 1970s, Acumen’s classically structured wines are recognized for their balance, complexity and age-worthiness. Centrally located in the heart of downtown Napa, Acumen Wine Gallery showcases wines from our organically farmed Estate vineyards on Atlas Peak. The Acumen team offers guests warm hospitality throughout three exceptional wine tasting experiences. The Summit Experience is the ultimate exploration of acclaimed wines from our rugged Atlas Peak estate. Guests are guided through a collection of six extraordinary PEAK and Mountainside bottlings in our private room, paired alongside delectable food complements to enhance your tasting experience. The Summit Experience is $75 per person, lasts approximately 60 minutes and can accommodate up to 9 guests per seating. Prior reservation is required. For a casual and convivial wine tasting experience, guests are welcomed into our stylish Tasting Lounge and contemporary art gallery. 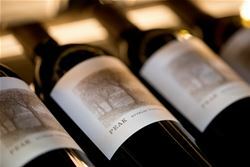 Presented with the choice of two tasting options, guests will enjoy a tasting of three current release wines from either the PEAK Flight ($40) or Mountainside Flight ($25). The Tasting Lounge experience lasts approximately 45 minutes and can accommodate up to 5 guests per group. Reservations are recommended, but not required. For large groups or special event inquiries, please phone the Wine Gallery directly at (707) 492-8336. To join the wine club, visit www.acumenwine.com/visit or call 707-251-8885. The Acumen Summit Society wine club ensures our most loyal customers always have access to our wines. Membership offers carefully curated shipments of estate-grown bottlings, access to our coveted PEAK allocations, invitations to exclusive SUMMIT events and exclusive member-only savings. Two shipments are offered each year, ranging from 6 to 12 bottles of our PEAK and Mountainside wines. To learn more or to join, please visit www.acumenwine.com/membership. We are pleased to offer Napa Neighbors a 2-for-1 Mountainside Tasting Flight (Value $25) and 10% savings on all bottle purchases.